Your smile is on display more than ever these days thanks to the internet and cameras being in every device you can imagine, and if you have noticeable flaws like stains, chips, cracks, or gaps, this can be unsettling to realize. Fortunately, no matter what aesthetic imperfections you might be dealing with, cosmetic dentistry can make them disappear. Working closely with our team, we can help you put together a cosmetic plan to achieve your dream smile using our expertise and the treatments below. Are you ready to get the smile you’ve always wanted? If so, contact us today. Porcelain veneers are really a wonder-treatment in the world of cosmetic dentistry, as they enable us to change the shape, size, and color of a patient’s teeth to whatever they want. Because of this, we can eliminate multiple cosmetic concerns at the same time, saving someone from having to get multiple procedures. They involve placing thin ceramic restorations over the front of the teeth, and you can get a custom-made set in as little as two appointments. Everyone wants to have a perfectly white smile, but factors like coffee, wine, tobacco, natural aging, and even genetics can all leave the teeth looking dull and discolored. Thankfully, our professional strength whitening treatments can easily make these stains disappear, giving you the dramatic results a store-bought kit simply can’t deliver. Whether you choose to whiten your teeth in our office or use one of our custom-made kits, the end result will be a set of teeth that is 6-8 shades brighter! Minor chips, cracks, and gaps are no match for cosmetic bonding. In just an hour or less, your dentist can apply a color-matched composite resin to your tooth and use it to mask any blemish you can imagine, literally sculpting the enamel to perfection. 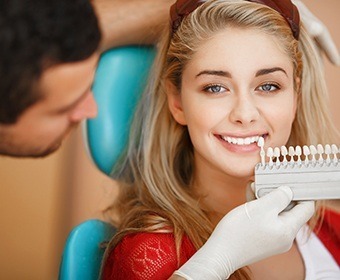 This procedure is not only quick, but completely painless as well, and you can look forward to your smile looking gorgeous for the next decade. Want to hit the reset button for your smile? Our team can help you put together the perfect smile makeover plan to completely transform your appearance using a unique combination of procedures based on your specific goals. Want to whiten and straighten your teeth? Looking to get rid of annoying gaps and fix longstanding chips and cracks? We can do all of this and more, and in the end, we guarantee you’ll love the results.